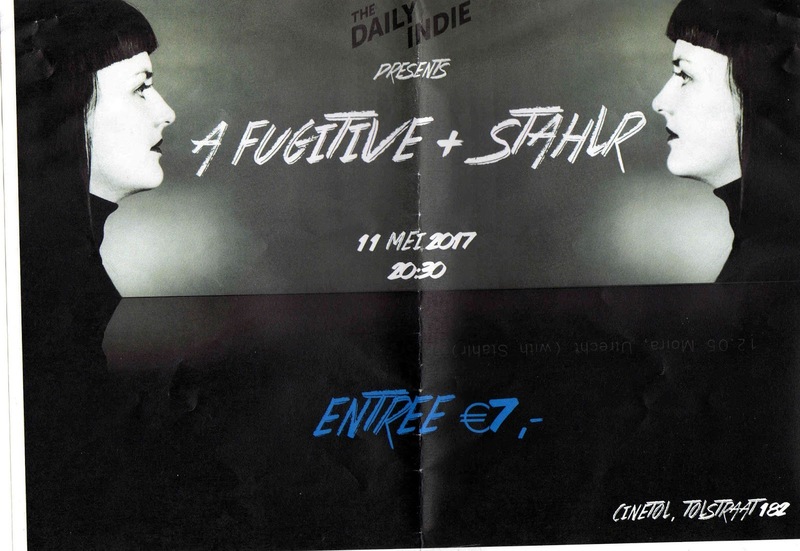 On the first summer's evening of 2017 I took the train to Amsterdam to go and see A Fugitive and a band?, solo artist? with the mysterious name Stahlr. It turned out to be one of the strangest shows I've attended. Not because of the music, but what was going on in another part of the building, where a restaurant and bar had been turned into a football match haven. Ajax was trying to qualify for the Europa League finals and managed. The two events inevitably started mixing for most people concerned. The show starting around the football and watching football in the interludes. Let's leave Ajax behind and focus on what I came to do, listen to music. Before the show started I had met with friends, family and booking agent of the acts. We were just about the audience I'm afraid. Simply too much competition of weather and Ajax. The good thing is that this did not deter both artists to play with the energy and commitment a show needs. Walking into the Cinetol stage was rather a strange experience. Near total darkness, smoke everywhere and no one inside. Absolutely no one. So back into the light outside. The darkness, the mist. It turned out that it was part of the act. When Stahlr, who I had got to know as Anne by then, stood on stage, all that could be seen, very, very faintly, was a person donned in a long, mysterious, hooded cape. Face hidden within the hood. Light coming straight from the bottom lighting the figure up for just a flash. Despite the glistening robe I was reminded of pictures of the Middle Ages. Of monks and the people who brought Black Plague victims to their mass graves. Only the protective, strongly pointed nose mask filled with herbs was missing. The hooded figure stood behind a desk with some electronics on it and in front of two panels with light bulbs and a laser. Big, dark, brooding beats started. So deep, reverberating the room. Immediately it was clear to me that the sound system here was so good as it not only withstood the onslaught, but made every nuance in the electronic sound available to hear. Without being too loud. (Later I found out that Paradiso assists here.) When the first song played itself out I found myself wondering why this can't be heard on the radio. Perhaps because the average speaker would blow itself up. Stahlr captured me totally, where I have to point out that she sings beautifully over these dark beats. Even the hiss from the smoke machine falls in with the beats. A lot is orchestrated to the last detail in this show. A technical problem with one of the songs, broke the spell. Here was no high priest of Egyptian times singing for us. All the music comes from a laptop placed on the floor. The magic and mystery comes from a well thought out light show. 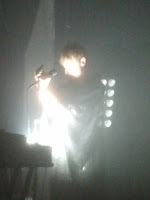 What Stahlr actually does on stage, besides singing beautifully, is cloaked in mist, mystery, light and laser. It worked for me though. After the break with a lot of football and excitement I went back in to watch A Fugitive. Followers of this log will recall how excited I was about her EP 'Coincidence' that was released this April. The three songs captured me fully and are charged with emotions. "A Fugative makes a statement ...of no small proportions" I wrote at the time. 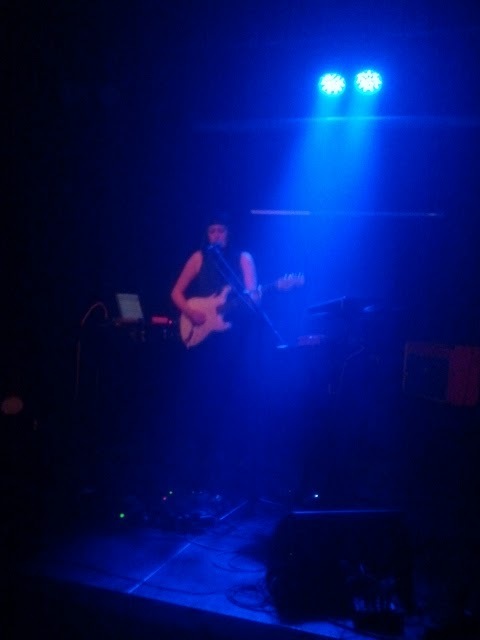 The stage was filled with electronics, pedals, a few keyboards, a laptop and who knows what else surrounding the singer and to contrast all the black, a beautiful white Fender Stratocaster in the hands of Rosan Rozema. Songs are built op from scratch with samples of melodies and sounds. Beats kicking in at the right moment that seemed pre-recorded. With each addition the mood of a song changed slightly; or by avalanche. Making music takes concentrations as everything has to fall into the right place. Here it is even more than that. While playing and singing it is necessary to start and stop sampling at precisely the right moment, making the sample coming back in or add whatever sound or rhythm, as there is no one else doing this when you're a solo act. On top of that the artist is performing so has to show just that. Practising and practising is most likely what it takes and Rosan Rozema showed that she was comfortable doing everything at once. And more, as she obviously stood her ground, self-assured and showing it in her performance. The songs from 'Coincidence' stood the test live effortlessly. The other songs sounded promising. A Fugitive is a project that deserves more listeners as things don't get more intense without losing musicality than this. A Fugitive simply pushes all the right buttons.